The Alliance For Change is aware that the Government plans to send home certain workers using the reduction made to the 2012 budget as the excuse.Instead of ‘weeding out’ the cronies and ‘fat-cats’ out of the system, the PPP/C Government is sacrificing ordinary cleaners and clerks and cutting the salaries of other rank and file employees to make a political point. This is devious.Prior, during and after the 2012 Budget debate and especially during the examination of the Estimates, the AFC made it clear that we do not want to send ordinary workers home. Terry Gajraj has been performing for over 20 years, spreading the Chutney music all around the world. 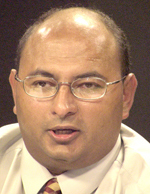 Read Terry Gajraj’s bio here. Catch Terry Gajraj live on May 27, 2012 at the Guyanese Association of Barbados Inc. “Taste of Guyana 2012″ being held at the Banks Sports Club ground in Wildey, Barbados as we celebrate Guyana’s Independence anniversary. Dave Martins will also be headlining this event. If you are in Barbados make this a ‘must see’ event. A major project to lengthen the runway at Ogle Airport to allow regional flights and bring it to regional standards, and which will allow for the landing of ATR and Dash 8 series class of aircraft has been completed. The European Union, through a CARICOM facility, and with support of the CARICOM Secretariat in Guyana and the Government of Guyana, had provided funding of 1.5M Euros for the Phase II project of the airport to lengthen it by a further 2,200 feet and widening it by 40 feet. Services offered at the Ogle Airport are now indispensable. The location has become a major hub for interior flights. It enables miners and timber operators an assured source to move their supplies and personnel, says President Donald Ramotar. Investments Limited (NICIL) are now poised to collide over the amount of money being held by the State’s holding company. Alliance for Change (AFC) Chairman, Khemraj Ramjattan, has contended that moneys being held in the accounts of NICIL, and which should be transferred to the Consolidated Fund, amount to some $50B, but there is a differing opinion from the entity’s head. It is with great excitement that we celebrate with our May edition of the Guyana Folk Festival newsletter. I take this opportunity to congratulate Guyanese everywhere on the Republic’s commemoration of its 46th Independence Anniversary. The Guyana Cultural Association joins all Guyanese in honoring this historic event that chartered a course for self-governance and development of the land of our birth.